A few weeks ago I found this little cabinet on Craigslist, and I thought it was adorable. I also think that it’s perfect for my dining room, since it is one of the smallest rooms in my house. Under normal circumstances, I would go more traditional with a larger buffet, but for my small room, that isn’t possible. I will be using this cabinet to store dishes or and serving related items. I have not decided what I want to do with it decor wise, but that decision will come in the future. 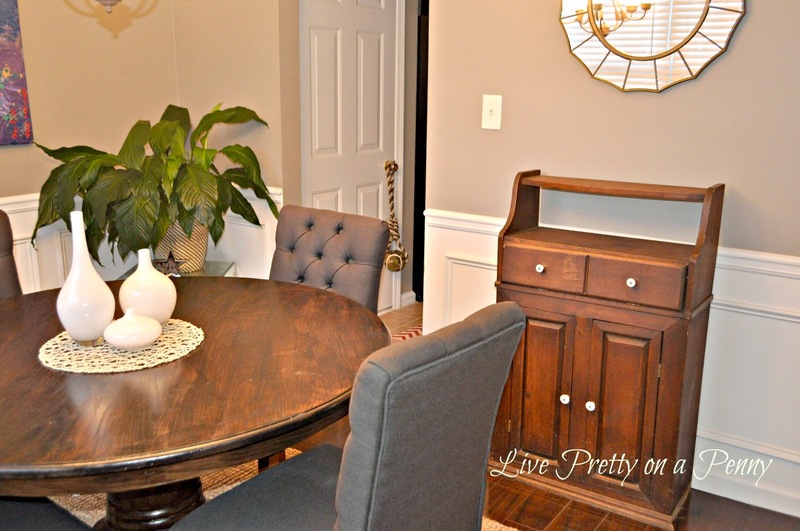 As cute as I think it is, it is SCREAMING for a makeover…or wait, maybe I am screaming for it to be made over, either way its gotta get a new look, with cabinet hardware and all. That’s where you guys come in (insert a big cheesy smile). I cannot decide on a color. I don’t want anything too loud, however I am not opposed to a color. I also thought about staining it the same color as the dining room table, but I don’t know if that will be too much brown. I just can’t decide, so please help me! To give a better visual, here is a look at the entire room. p.s. disregard my sad looking peace lilly plant in the corner. I neglected it during the Haven Conference and it started to look super sad. Now it’s coming perking back up, so that’s positive. Anywho, any help that you all can provide would be awesome!!!! Please leave your suggestions in the comments section below. Thanks for your help and for stopping by today. What a great piece, and yes, perfect size for the room. I wasn't sure until I saw the view of the entire room, but as soon as I saw your beautiful painting I knew it needed a color. It would pull the color across the room. And, some fun knobs would make it perfect. Color??? I would pull one out of the painting (not the yellow though…that wouldn't look good with your wall color). But maybe a lighter version of one of the other colors. Can't wait to see what you do. Thanks Dee D. I think i may have narrowed a color down thanks to all of you guys' feedback. So excited and cant wait to show you. I love how your room is coming along. I vote for paint and new knobs! I Maybe gold toned knobs to compliment the gold in the mirror above. What colors are you leaning towards. Your sister's painting leaves you open to a lot of options. My favorite shade is the blueish-purple in the top right corner. I think it would go nicely with your chairs as well. Good luck! Can't wait to see it come together. What a great space! And I do love the new piece of furniture. 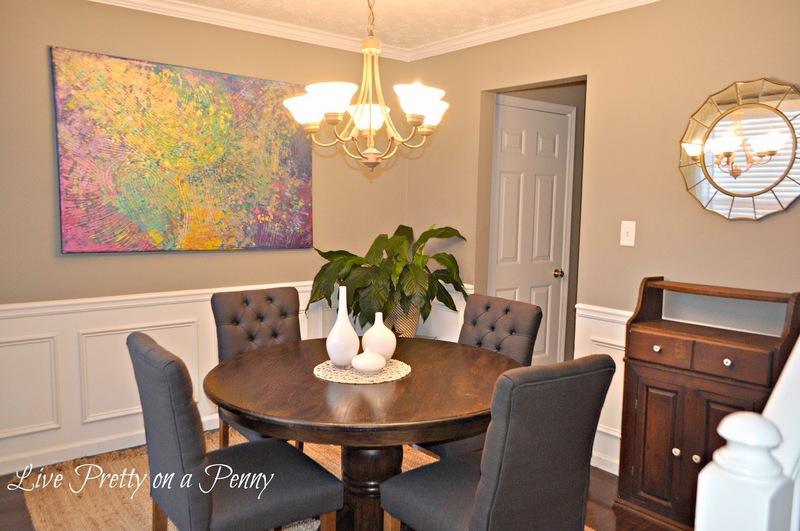 I think it's one of those pieces that looks great as is, but could also be painted especially since you already have browns in the room. I think I would pick one of the purple or green colors from the painting as well, depending on what table decor colors you tend to use. This is a great space. Looking forward to seeing what you decide. Here are two links to bloggers I follow that have great painted furniture:1. http://www.pinterest.com/bonniegetchell/revolutionaries-furniture-projects/2. http://blog.artisticexpressionsbyelisabeth.com/2013/08/buffet-tutorial-guest-post.htmlp.s. Love the round mirror and those dining room chairs! HI Erin, I agree that a color would really pick that piece up. My first thought is to choose something that is in the blue/purple family. I know not a real color for you know what I mean! I think something in that range would work well with the painting and the chairs. Can't wait to see what you select. Thanks Tina for stopping by. I love all of the feedback that I received from you all, and its been helpful in making a selection. I am hoping to share soon! I gave you my ideas yesterday on IG – I 'cant wait to see where your project ends up! Your space is so pretty and I know whatever you choose is going to be lovely! IDK how I missed this post. But I think you have made you decision so I'll just say can't wait to see the outcome!